Immerse yourself in rural heaven and discover the charm, tranquility and luxury of Little Vicarage. Set in an acre of stunning established gardens, the apartment occupies a sizeable wing of the grade two listed The Old Vicarage within the picture perfect hamlet of Gwennap offering superb access to the both the North and South coastlines of Cornwall. This chic apartment has been thoughtfully created with holiday comfort and style in mind ensuring indulgent luxury for couples and small families. The extensive grounds are flawlessly maintained whilst the outdoor heated swimming pool (**available from 1st May - up until late October) sets the scene for lazy poolside days away from the hubbub of the coast. Little Vicarage welcomes one well behaved dog to stay. Follow the avenue of Cornish palm trees and arrive to the oasis of Little Vicarage. The house was built during Georgian times and still maintains a great sense of grandeur and charm from the original bath stone and Cornish granite to the verdant gardens and indulgent swimming pool. The apartment is set on the first floor, climb the stone steps to the side at the house to the hidden away courtyard and private access. Once inside, this spacious holiday home from home oozes Regency charm from the high ceilings to the large sash windows flooding the rooms with light and warmth. The kitchen adds a modern twist to the traditional style with smart black and white fittings and cherry red accessories, self cater in style using Cornwall's finest artisan ingredients. Lead through to the open plan living and dining space and gather with family and friends. The living room offers 2 relaxing sofas and has been dressed to perfection with soft pastel shades creating a unique country ambiance, gaze out across the grounds from your elevated position. Little Vicarage offers two boutique style bedrooms each considerately styled with fresh white linens and warm plum soft furnishings. Each bed can be set as a 6 ft double or as a twin for your stay whether it is a quiet weekend of Cornish zen with friends or week long adventure exploring the county. The bathroom is no less considered offering the perfect pamper with a deep bath and modern shower. 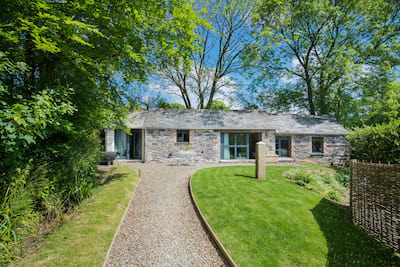 From the moment you arrive, sink into a Cornish timetable of rest and relaxation within the beauty of Little Vicarage. Step from your holiday door into the private secluded walled courtyard. This wonderful space brims with exotic flora and fauna in all seasons from vibrant evergreens to blooming roses, lush tree ferms to olive and fig trees creating a stunning backdrop to your al fresco dining. A large wooden dining table with chairs welcomes lazy breakfasts and lunch on the go or dress the table for summer celebrations. Guests are invited to explore the extensive gardens of The Old Vicarage complete with established arboretum and lawns which are beautifully maintained. The outdoor swimming pool really is rather special offering a Tuscan style setting with a Cornish twist, soak up the sun from the loungers as children play or enjoy a morning dip before heading out and about. A private gate leads down to a path adjoining the Church with its' unusual detached Bell Tower. The hamlet of Gwennap and surrounding countryside offers a true taste of Cornwall with winding country lanes and mining heritage, a number of country pubs extend a warm welcome to visitors including The Fox and Hounds at Comford just moments from Little Vicarage. With the central location, pack up the car and head to the rolling surf and high cliffs of North Cornwall or head towards Falmouth and the more sheltered sailing waters and coves of the South coast. 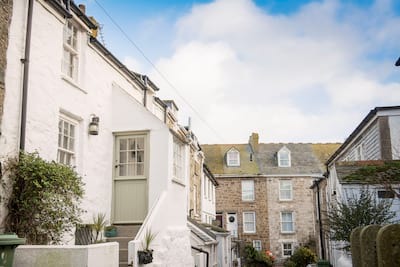 Little Vicarage comes highly recommended by the Cornish Gems team for guests looking to escape the bustle of the coastal towns yet enjoy the luxury of a rural Cornish setting with first class holiday living. Little Vicarage is a stunning property and our every need seemed to have been second guessed prior to our arrival. We found the location ideal to then explore the delights of Cornwall during our week's stay. Accomodation was to the highest of standards, everything we needed was in the apartment. The owners Paul & Lewis are lovely and were very welcoming and nothing was too much trouble. The Little Vicarge is situated in an ideal location, which enabled us to explore Cornwall with ease, from Falmouth to St.Ives. We've stayed in some nice houses over the years, but this one was one of the best. Lovely accommodation, great pool. The location is great for getting to both north and south coasts within 20 - 30 minutes and across to the Roseland. A beautiful home with stunning gardens and pool. We will certainly return in the future. Stayed at Little Vicarage over New Year. The apartment is great - well equipped, spotlessly clean and warm and comfortable. The owners, could not have been more welcoming. Had a truly relaxing week. The area is nice, lots of good walks and the dog had a great time too. Would definitely recommend Little Vicarage and planning to book another stay soon. Gave us just the break we needed. The little vicarage was a perfect holiday escape. The property and grounds are stunning. The pool was fantastic. 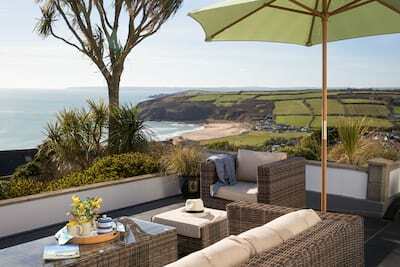 The location makes it easy to access much of Cornwall whilst still feeling like you are in a very tranquil area. Quality and high spec'd properties. A real treat when on holiday. We were wowed the moment we arrived, the house and grounds are spectacular and the apartment had been finished to a very high standard with everything you could possibly need. The highlight for us was the pool, always very clean and warm with lighting that changes colour at night! The house is in the perfect location as it is quiet and away from the crowds but yet many places are accessible within under half an hours drive. We really were sad to leave but look forward to going back.